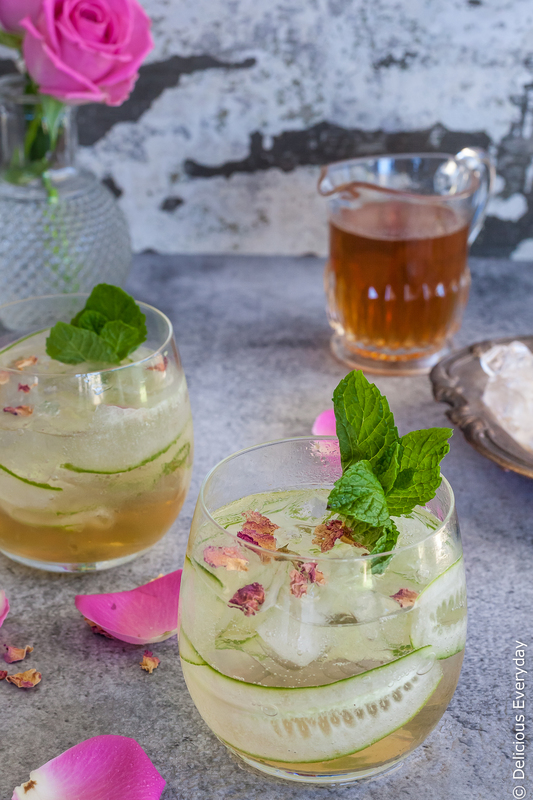 This delicately perfumed light, fizzy Rose and Cucumber Collins cocktail is a perfect pre-dinner sipper. With refreshing cucumber and a homemade rosewater syrup it is the perfect compliment to aromatic gin. 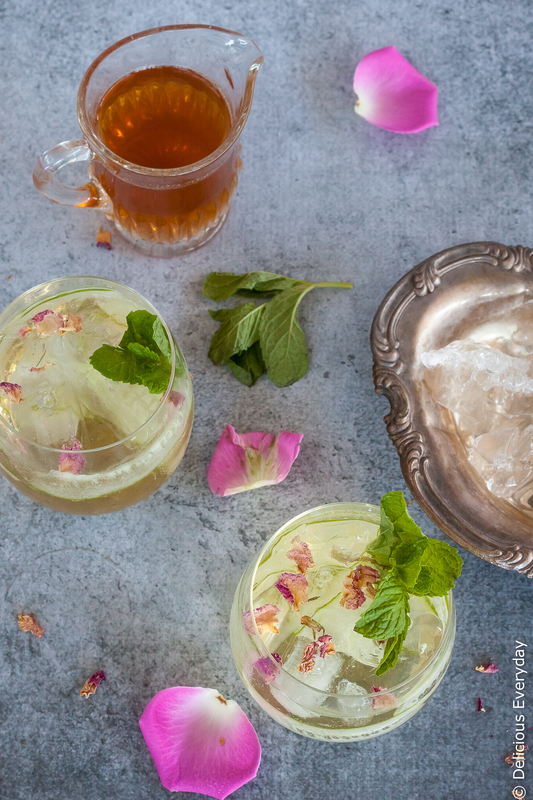 Perfumed, delicate rosewater can be a wonderful thing. Add too much to food, or a cocktail, and it’s like eating a candle! If, like me, you’ve ever had a bad experience with rosewater then you can be a little apprehensive at the thought of adding it to your food or drinks. But believe me, when it works, as in the case of this wonderful Rose and Cucumber Collins, it can be a truly beautiful thing. First up you’ll make a batch of homemade rosewater syrup. Basically its a simple syrup, to which you’ll add lime juice and rosewater. 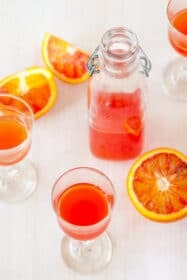 If you take a look at the recipe it may seem like a scary amount of rosewater, however, after simmering away for 10 minutes you’ll not only have wonderfully perfumed kitchen, but the most amazingly gorgeous syrup that you’ll want to add to everything. The rose syrup pairs beautifully with delicate shavings of cucumber, which have a ever so slight floral note all their own. Add a splash of gin and sparkling water from my Sodastream and you have the most amazingly addictive homemade rose and cucumber collins. Perfect for sipping on those long hot summer evenings. 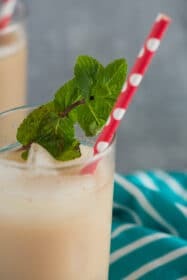 For a day time/mocktail version, simply omit the gin, and it’s just as delicious, refreshing and cooling. 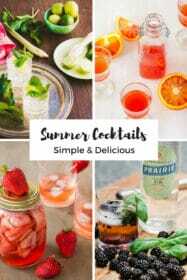 So tell me, what is your favourite cocktail to sip on long hot summer evenings? 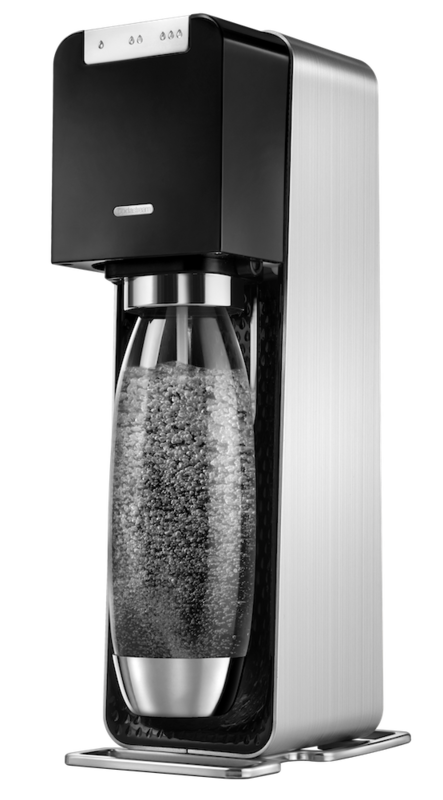 Head on over to leave a comment here and tell me what you would make with your new Sodastream Power valued at $249. Add the water to a medium saucepan, along with the suger, and bring to a boil. Reduce to a simmer, and simmer for 10 minutes, until the sugar is dissolved. Add the lime juice and rosewater and cook for a further 10 minutes, stirring occasionally. 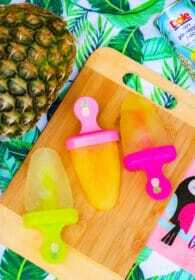 Pour into a sterilised jar or bottle and allow to cool. Rosewater syrup recipe from epicurious. Makes roughy 500ml of syrup. 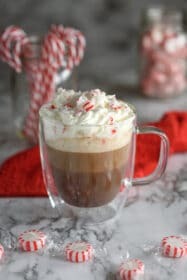 This recipe was sponsored by Sodastream. Thank you for supporting the sponsors that keep Delicious Everyday delivering free recipes to your kitchen! 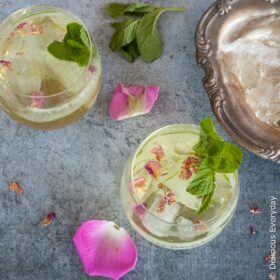 I love using cucumber in cocktails, but I’m inexperienced with rosewater — I like the sound of it, though — and it certainly looks like a tasty summer sipper! What a lovely sounding refreshing drink, I love the flavour of cucumber and make a cucumber lemonade in summer that is just fantastic. Totally agree with you about rosewater, a little really does go a long way and you do jhave to get it just right. This is an absolutely beautiful drink! I have never used a soda stream before, but I want to get one now to make cocktails. I can just taste the rosewater… oh my gosh. A very refreshing drink! It must taste lovely.